Home > History of Pinnacle > Why Carnauba? Pinnaclewax.com is the home of the best car wax, Pinnacle Souverän™ Carnauba Wax. Widely regarded as the finest show car wax, Souverän™ and its counterpart Signature Series II both contain No. 1 grade carnauba wax imported from Brazil. Why did we choose carnauba wax to make our premium car waxes? Because only the best carnauba wax makes the best car wax! Carnauba wax has several characteristics that make it a superior form of protection for your vehicle’s paint finish. Beyond visual appeal, which carnauba definitely has, carnauba wax is also good for the paint. We’ve compiled a list of the reasons why carnauba is the only choice for Pinnacle’s premium car waxes. 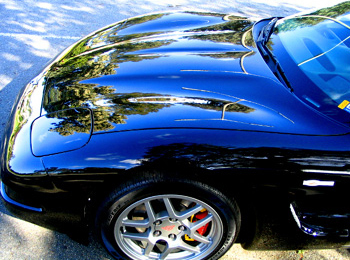 Carnauba wax produces a warm, wet-looking shine that is unparalleled by any other form of paint protection. Perhaps it’s a testament to the hot, wet climate from which it came, but carnauba looks as if it might drip off the paint. It has a depth and richness that has been winning over car lovers since the 1960s. Carnauba wax is, hands down, the best car wax for show car preparation. Pinnacle’s proprietary formulations take full advantage of all carnauba's incredible qualities. You’ll find that each jar of Pinnacle Souveran™ and Signature Series II is bursting with genuine carnauba and paint-wetting natural oils that further enhance the shimmer. Remember, the best car wax starts with the best carnauba wax! 2003 50th Anniversary Corvette Z06 by D.K. of San Diego, CA.